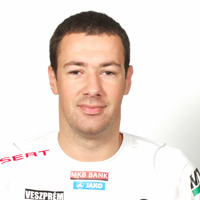 13.10.2010 - Current top scorer of VELUX EHF Men’s Champions League transfers to Kiel in 2012. "My legs are much stronger!" 07.10.2010 - Veszprém’s goal machine Marko Vujin is full of confidence. 02.10.2010 - Hungarians beat Hamburg and remain spotless like Löwen after the victory in Celje. Summary of the eight Saturday games of Match Day 2 in the VELUX EHF Champions League.